The Chris & Vicky Cornell Foundation was formed in late 2012 with the mission to protect vulnerable children around the world. The foundation supports organizations that provide shelter and resources for homeless, abused and at risk youth, children living in refugee camps and victims of human trafficking. While most of their philanthropic work has been private and anonymous, Chris and Vicky formed the foundation based on their personal experiences working in the child protection space. The foundation initially focused on helping homeless and neglected children in Chris’s hometown of Seattle and other private donations. Last year, the producers of the film, The Promise – a love story set against the backdrop of the Armenian genocide – approached Chris to record the movie’s theme song. The beautiful ballad, with its inspirational lyrics, has been embraced by human rights and refugee aid groups and is a clarion call to people who care about the plight of refugees and victims of war. Chris and Vicky decided that all proceeds of the song would be donated to the International Rescue Committee to support their work with refugees. 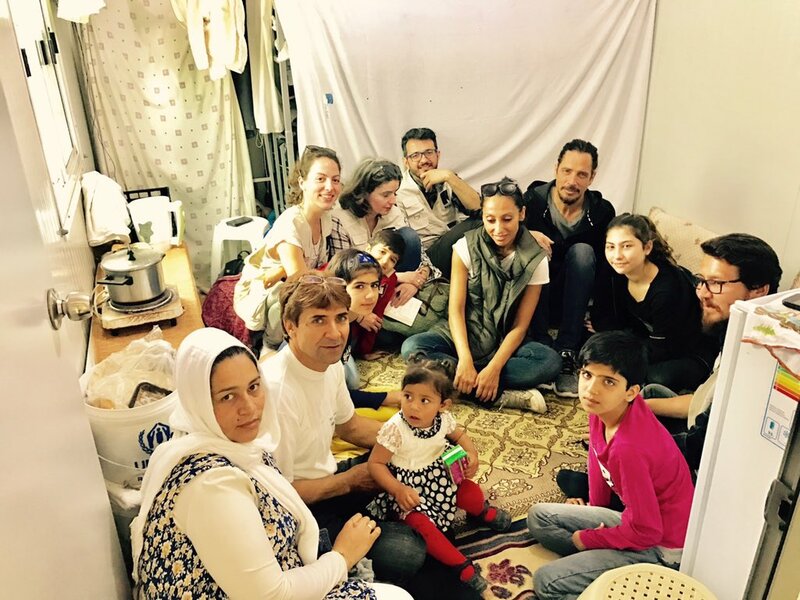 In April of this year, Chris and Vicky went to Greece to visit the Eleonas refugee camp. Accompanied by staff from the International Rescue Committee, they met with Syrian families who fled the horrific violence that has engulfed the country for the last six years and resulted in the largest refugee crisis since World WarII. The heart wrenching stories they heard from the families affected them deeply, and because of their desire to help the world’s most vulnerable children, the Cornells committed to providing support to the camp through an education initiative. Vicky returned to Greece in September to visit additional camps and to meet with Syrian families. In July, Vicky established the Chris Cornell Music Therapy Program for the Seattle-based nonprofit Childhaven in honor of what would have been Chris’s 53rd birthday. Vicky committed $100,000 to Childhaven to bolster the organization’s efforts to help children and their families overcome the effects of trauma.